Robinson Cano's stalled contract negotiations lead the back page of today's New York Daily News, but there's a reefer, up top: "FLIGHTMARE: Revis to Pats? It could happen." This means trouble. Tell us, Gary Myers, should Jets fans—and otherwise affiliated enemies of Patriots dominance, which is to say, fans of the league's other 30 teams—be worried? The ultimate nightmare for the Jets in the next 12 months: The Patriots make it to Super Bowl XLVIII at MetLife Stadium, spend a week practicing at the Jets' facility in Florham Park, and five weeks after the game Bill Belichick is holding up a blue No. 24 jersey at a jam-packed news conference in Foxborough to announce the signing of free agent cornerback Darrelle Revis. If all that happens, Woody Johnson should just move the Jets to Des Moines. That's a nightmare tableau! Look at that photo! The good people of Des Moines wouldn't even deserve the de-Revised Jets afterward! So, this is going to happen, right? It would be out of character for Belichick to sign a big ticket free agent, but his contempt for the Jets is so deep and his need for a shutdown corner is so great, that it would not be shocking if he used some salary-cap creativity to structure a deal for Revis, especially with the extra cap room Tom Brady's contract extension opened up. Curtis Martin went from the Patriots to the Jets. 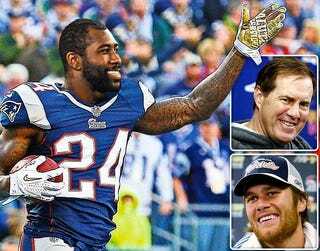 Could Revis switch sides in this heated rivalry and play in New England? "It's not that far-fetched," an NFL source said on Thursday. "It would not shock me if he's in a Patriots uniform next year." Got it, folks? This other thing happened 15 years ago, and "an NFL source" wouldn't be shocked, even though this is what New England doesn't do. So here, readers/suffering Jets fans, have a photo of Darrelle Revis in a Patriots jersey! Great work, all.